Metro cities – advertisment or article? Another example of blurring lines between editorial content and ads is today’s Metro. 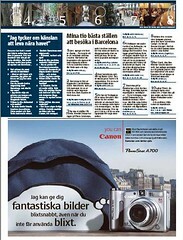 The Swedish free daily Metro has always been creative in integrating advertisers into the paper, for example by using the entire front and back for ads. 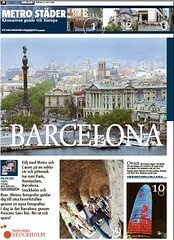 Today Metro launches a co-operation with Canon called “Metro cities – the expert’s guide to Europe”. Nowhere in these two pages it states that this is an advertisment. What it does say is that all photos are shot with a Canon Powershot. The second page contains a half page ad for – Canon PowerShot A700. Not very credible.